Zack is seven. We pulled him out of Montessori preschool when he was three and a half years old to homeschool part time, which turned into homeschool full time. He is brilliant and came here with a few bells and whistles. Our homeschool years were fun and stressful and our school search was intense. He is the most social person I know and I am the most anti-social pro-solitude person I know, so we are all happy that he will get to go to an amazing school with amazing teachers and peers every day. His new daily social life as a second grader marks the beginning of my new daily early-morning life as an ex-homeschooler. I will now have to get up in the morning and function during a time when I am usually just getting into my REM sleep. I will have to change some of my nocturnal ways. In the meantime I will become one with my coffee beans. The first day of school is behind us and I must say, we kilt it. 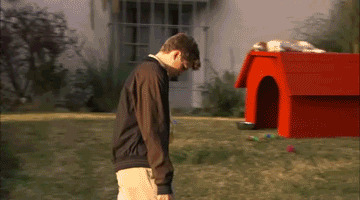 I was going to write all about it, but why write mere words when GIFs can say so much? *Disclaimer: I did not create these GIFs and have no idea where they originated unless they're watermarked. Zack woke up like this.. I drove all the way home singing aggressive rap lyrics as loud as I damnwell pleased. I showered, changed into yoga gear, then I had my second meal of the day. Today was so awesome in so many ways, for so many reasons. It went just the way I had planned. I know better than to expect this kind of perfection every day, but today sure was a good day. I always imagined I'd just veg out all day the first day I became free from child maintenance during school hours. I'm actually super proud that I accomplished my to do list. How did you send your child's first day of school? Are you Team Veg or Team Git er done? P.S. Thanks for reading! If you like this post, please share it with your friends in social media land. Laughter is good like a medicine. Heal somebody! To follow my blog, enter your email address in the box at the top right of this page to subscribe and get my posts right in your inbox, or click here to subscribe to my feed. P.P.S. Here's Zack on his first day of preschool and on his first day of second grade. He's just a little bit taller. I love this so much. I hollered at every GIF and I'm feeling all the things. You. Are. Back. Wow.Someone was productive! Gif madness! Loved the way you "felt" when you walked out of the gym. Um about Ms. Tish. Checked her out. I like her freestyle~language not so much. This was awesome. The only addition I would make is to add an GIF of Ice Cub saying "Today was a good day."